Wind Ranges related to kite Sizes, please share you experience! 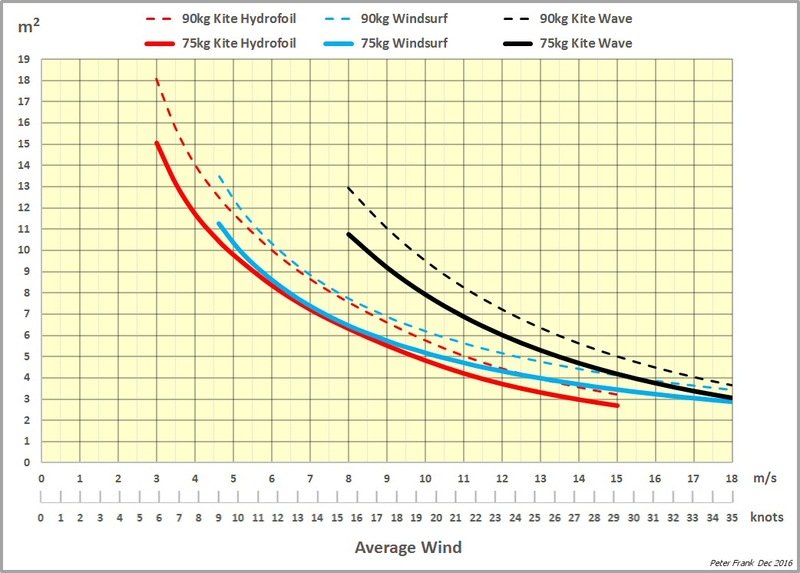 Re: Wind Ranges related to kite Sizes, please share you experience! So as you can see from my other posts right now, I get a little long winded. I will try not to do that here because your answer is either really long or really short. First, we do not know the rocker on your board. That has a huge effect on the power requirements of the board. Secondly, we do not know the consistency of wind in your area, nor whether you would size down for safety due to potential rotor or updrafts in your area. And third, what are you using to measure wind speed on the beach, on the inside, in the break, or on the outside. The simple answer for you is what ever you feel works on the gear you are riding, and it looks like you have a good feel for where your kites work for your skill level right now. There's no one answer for kite size it all depends on conditions, and what you want to do. Megaloops, wakestyle, airstyle, they will each have a different wind range. Just ride what you feel comfortable and don't be too worried if someone is on a different sized kite. Yep, charts may be a good guideline for beginners, but intermediates-pro just choose by experience - likely without a wind meter. But use local advice when in an unfamiliar kiting location. I was just up kiting in Tahoe yesterday and another thing that's often not taken into account is elevation. I know most kiting is performed at sea level, but many kite inland lakes and reservoirs. Tahoe is at 6200' (1889m), so conditions there require rigging a bigger kite to compensate for the elevation and thinner air. I've seen people launching 9m kites at Tahoe thinking the wind feels the same as their usual spots at sea level and then finding that they can't get off the beach. Another thing often overlooked is the air temp and humidity. These factors also play a roll no matter the altitude. You can see a scientific calculation on kite sizes in different winds, correlated to what I use myself. In the low end nothing is easy and very uncertain, as the apparent wind and type of kite and board etc means so much, but above this point you can take the curves as a given quite precisely, which size has the same power in more wind, just correlate it to your own "power" liking of course. Push the line up or down according to your own preferences, meaning if you like to ride a TT lit and same weight, you take maybe two kitesizes bigger than I do on a waveboard - so it just means you should follow a line like if heavier. This is just the opposite of what everyone expects. The reason is the difference in weight of the molecules. "Moist" in the air is almost half as heavy as the air itself, so to speak. The molecule weight of water is 18 (H2O = 2 x 1 + 16 = 18). Air is 78% Nitrogen and 21% Oxygen and the last % some other gasses. Molecule weight of N is 2 x 14 = 28, and of O is 2 x 16 = 32.
thank you Peter and RalfsB! 15m Elf Joker 7 on 17m lines - most days, until the meters are truly hitting 17 knots. This looks like pretty vigorous, constant white caps. 9m Cabrinha Velocity on 21m lines - Meters are hanging at 19kts, spiking into the 20's. This is not a lot of fun for me anymore, once I can't ride the 11m it's kind of survival mode. 7m Ozone Edge on 21m lines - only did this 1 time in like 30+kts during a regatta, it sucked, it was either exactly the right power or no power at all. Not fun riding conditions.